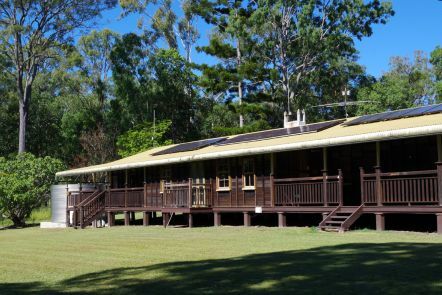 The facility is home to The Barracks and the heritage-listed Slab Hut. 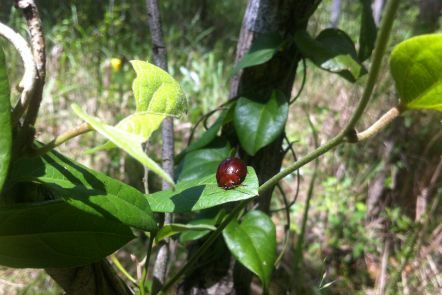 The peri-urban ecosystem has a diverse range of wildlife, including the Acacia Leaf Beetle (Dicranosterna picea). 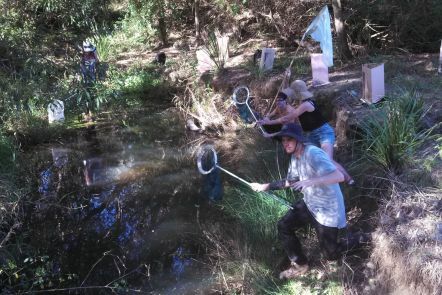 Students from our Insect Life unit collecting insects from Samford creek. 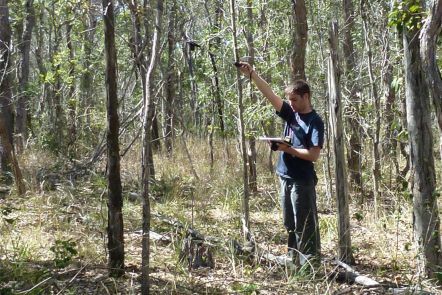 Dr EN Marks Sustainability Award winner Matthew Keir using an imager to calculate canopy cover and the amount of sunlight reaching the ground through the trees. The Samford Ecological Research Facility (SERF) is a living laboratory for research and educational experiences for our researchers, students and visitors. Managed by the Institute for Future Environments (IFE), the 51-hectare property is located in the Samford Valley, 25-minutes northwest of QUT's Gardens Point campus. The facility is a base for our research, teaching and learning in a range of ecological, engineering, built environment and educational programs relating to urban development, and its impact on ecosystems. SERF is a unique facility that provides researchers and students the opportunity to investigate the climate, environment, soil, water, vegetation and wildlife of a peri-urban ecosystem. Students visit SERF to study the site’s flora, fauna and ecosystem ecology using a variety of field survey methods. In 2009, SERF became one of the first SuperSites established in the Australian SuperSite Network. Each SuperSite is used to observe and measure long term changes in flora, fauna and biophysical processes over time and contributes to national data on environmental variability and the impact of urban development on ecosystems. 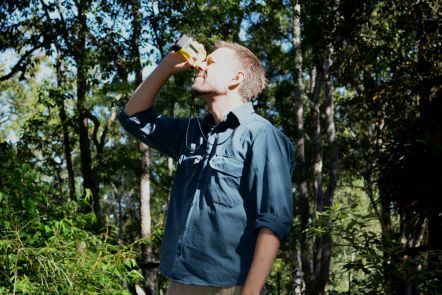 The property was generously bequeathed to QUT in 2009 by renowned Queensland entomologist Dr Elizabeth Nesta Marks AO, who conducted world-recognised research with mosquitoes and malaria in the 1940s and 1950s. Each year, we present one undergraduate student with the Dr EN Marks Sustainability Award to recognise research projects that engage the wider community and maintain the environmental integrity of SERF. Licor infrared gas analyser for CO2. Our acoustic sensors provide ecologists and conservation biologists with the ability to scale environmental observations both temporally and spatially. Automated sensor systems can be used to collect data passively as they do not interfere with the behaviour of the observed species and have minimal impact on the environment. They also provide a cost effective means of collecting data and greatly reduce human error associated with instantaneous surveys. The flux station located in the cleared pasture area at SERF is used for carbon dioxide and water flux measurement, automated greenhouse gas measurement and weather monitoring. Water quality monitoring systems are located onsite and used to measure the area’s hydrology. The Barracks is the headquarters of the property, and offers toilet and telephone facilities, first aid kit, fire extinguisher, potable drinking water and rainwater for cleaning and sanitation. As well as the Barracks, the property is home to the heritage-listed Slab Hut, which has restricted access. Each year we host a public information session for Samford residents and visits by external researchers and government representatives. Contact us to arrange your visit. SERF is also open to prospective QUT researchers who propose projects that are consistent with the facility’s mission of research, education, sustainability and long-term resource protection. Our annual reports provide an overview of our activities, research projects and developments since the site was bequeathed to QUT.